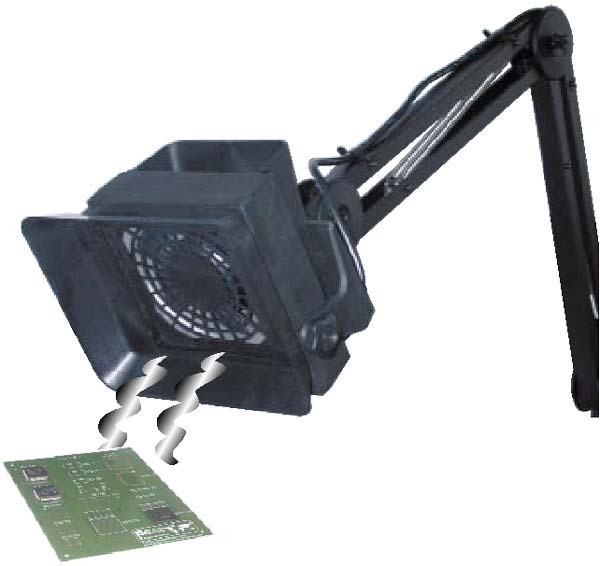 Aerodynamic design of fume-collecting hood enhances collection of harmful soldering fumes away from the operator through carbon-impregnated filter. Use of this type of fume extraction is recommended on every bench where central fume extraction is not available. ESD safe and equipped with a powerful fan that provides highly efficient smoke absorption at low noise. Filtration is accomplished with an activated, carbon-impregnated urethane foam filter which can be easily replaced. Highly recommended for factories without exhaust equipment and laboratories where desoldering is performed. High quality, high capability, but inexpensive. Aerodynamic hood design effectively draws irritating soldering fumes away from the work area. Carbon-impregnated filters trap a limited portion of the flux fumes. Compact size, low profile and adjustable stand allow convenient placement 6" to 8" (152 mm to 203 mm) from work area. Articulating arm allows optimized positioning and saves bench space. 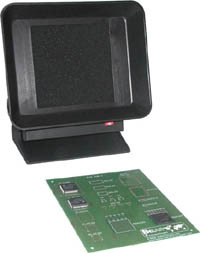 ESD safe and comes with powerful fan that provides highly efficient smoke absorption at low noise. Slide the activated carbon filter in position. Plug power cord into proper power outlet (110-120 or 220-240V AC). Set the absorber to face the fume source for best operation.